It was really cool to see the longboats, but I feel like it was a bit "here us what we found" rather than an educational experience about long boats and Vikings. It could be so much more! Also, they have lockers outside for bags but everything inside is well fenced off or enclosed in glass... And there are so many security guards... Worth doing. Doesn't need more than 1 hour though. 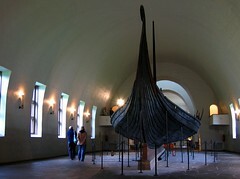 Amazing to see the Viking ships, they are beautifully detailed and preserved. The sleds, carts, and fabrics are wonderfully decorated and preserved. It was great to see these items in person and have a glimpse into this part of the Viking history. I would recommend this museum to anyone interested in the Vikings. Be aware there is no A/C so don't visit on a hot day. Great museum with loads to see. Takes a little bit of a walk to get to from the other museums just off the Fjords but definitely worth it. Has a great film shown over the wreckage. Staircases lead up to platforms to give you a view over the top of the ships. Lots of detail. You need to spend a good amount of time here to truly appreciate everything. We had a great time here. It feels like being immersed in ancient history. The building is beautiful and the exhibits are well organized and informative. Great photo opportunities here, although it's extremely crowded due to large tour groups.